With the holidays coming up, you may be planning a getaway trip so that you can transition into the New Year rejuvenated. We don’t blame you! While chilling out in island paradise, or going skiing in the Swiss Alps are fantastic options, have you ever wondered what it’s like to explore a castle? Yes, they still exist. Matter of fact, there’s quite a few around the globe that have existed for centuries! It’s truly an incredible feeling to explore some of the world’s most long-lasting time capsules, imbibed with a rich history. And if you’re in the market for purchasing some, there are quite a few castles and chateaus for sale in the USA. Killyleagh Castle dates back to a whopping 1180! To put that in perspective for you, this was in the era of the High Middle Ages. The castle is located in, indicative of its name, Killyleagh, Northern Ireland, and dominates a small village, flanked with large, circular, battlemented turrets. It follows the architectural style of a Loire Valley chateau, which is an attractive mix of late Gothic and early Renaissance. King James I gave the land to James Hamilton, another Scot, who later turned the castle grounds into a successful Protestant Scots settlement. The castle was continuously passed down the bloodline over the centuries, and went through a plethora of different renovations along that time: namely, the drawing room, dining room, and library. Guests can also enjoy picturesque terraces and hanging gardens on the steep slopes of the south and south west side of the house, as well as formal canals and fish ponds. Additionally, the castle contains a fully functional swimming pool and tennis court, available for tenants. Rochester Castle stands on the east bank of the River Medway in Rochester, Kent, South East England and has a complex history of destruction and rebuilding. The castle also has a keep, a prominent tower of Kentish ragstone, that was built in 1127 by William of Corbeil, Archbishop of Canterbury, with the encouragement of Henry I. It comprises of three floors above a basement, and stands at 113 feet high. Attached is a tall forebuilding, equipped with its own defenses to pass through before the keep itself could be entered. This structure is one of the best preserved in England or France. Which is truly incredible given that in 1215, the castle endured an epic siege by King John, who used the fat of 40 pigs to fire a mine under the keep, and bring the southern corner crashing down. Fortunately, the castle was restored under Henry III and Edward I, and remained a viable fortress until the 16th century. Guests can enjoy tours that run from 10:00 AM to 4:00 PM; though beware, be prepared to do some climbing! 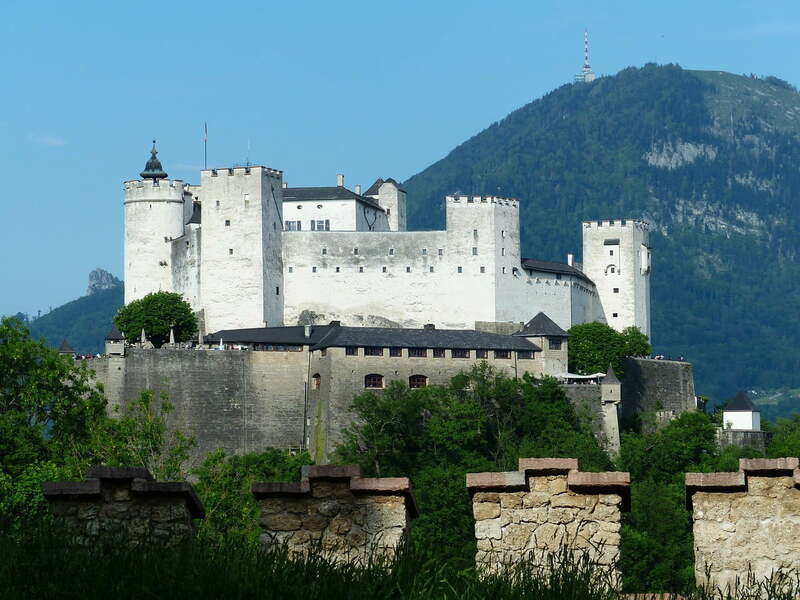 This castle was established in 1077, and sits atop the Festungsberg, a small hill in the Austrian city of Salzburg. Commissioned by Prince Archbishops of Salzburg, the castle spans a length of 820 ft and a width of 490 ft, making it one of the largest medieval castles in Europe. Politics-wise, this castle was fortunate enough to only go under siege once during the German War in 1525, when a group of miners, farmers and townspeople tried to oust Prince-Archbishop Matthaus Lang, but ultimately failed to take the fortress. In recent history, the castle has served many purposes. During the early 20th century, it was used as a prison, holding Italian prisoners of war during World War I and Nazi activists. Later, German ceramicist, sculptor and painter Arno Lehmann, lived in Hohensalzburg Fortress from 1949 until his death in 1973. Most recently, the castle was the main motif for the Austrian Nonnberg Abbey commemorative coin, minted on April 5, 2006. The fortress is open year round, and even includes a museum that boasts a display of objects plucked from the courtly lifestyle of the prince-archbishops. Warwick Castle is a medieval castle developed from William the Conqueror in 1068. Initially, the castle was motte-and-bailey, but it was rebuilt with stone in the 12th century. It was used as a stronghold until the early 17th century, when it was granted to Sir Fulke Greville by James I in 1604. The castle was then converted to a country house and it was owned by the Greville family, who became Earls of Warwick in 1759 until 1978, before it was ultimately bought by the Tussauds Group. It was then purchased by the Blackstone Group, which was merged with Merlin Entertainments. Warwick Castle is huge on tourism. Matter of fact, people have been visiting the castle since the end of the 17th century, and this grew in importance through the 19th century. In 2001, Warwick Castle was named one of Britain’s “Top 10 historic houses and monuments” by the British Tourist Authority, and was recognized as Britain’s best castle by the Good Britain Guide in 2003. By this time, it was getting about half a million visitors a year, with many tourists gawking over thousands of years of jaw-dropping history. Tickets are roughly £17.50. The Citadel of Aleppo is a large medieval fortified palace located in the center of the old city of Aleppo, Northern Syria, designated as a World Heritage Site by UNESCO. It is considered to be one of the oldest and largest castles in the world, with usage of the castle dating back to the 3rd millennium BC. The castle has housed various civilizations, such as the Greeks, Byzantines, Ayyubids and Mamluks. The castle suffered a lot of damage during the Syrian Civil War, but was recently reopened to public in early 2017, with repairs to damaged parts still underway. Architecturally, the castle has several prominent features, the first one being its moat. Though no longer filled with water, it has steep ridges comprised of stone that dates back to the Era of Ghazi Al-Ayyubid. The next feature is the main entrance, which is connected to the external gate by an eight-arch bridge. The bottom of the bridge goes back to the Era of Al-Zaher Ghazi, and the top goes back to the Mamluk period. On the door, engraved snakes embellish the material, with the names of Qalawun and Al-Ashraf Khalil displayed. Another feature includes the Royal Hall, which was built over the main entrance of the Citadel, and overlooks the tomb of Al-Zaher Ghazi Al-Ayyubid. The entrance is ornamented in gorgeous yellow, black and white stone carvings, with straight level ceilings maintaining the style of the famous Aleppine houses. There’s small windows in the Hall designed to shoot arrows out of. Additionally, the Royal Hall has a hidden door leading to a secret passage! The castle is open to guests, and has many more attributes worth exploring.